Capital of Bavaria, Germany. It has (1904) a total population of 499,959, including 8,739 Jews. When Jews first went there is not known, but since by 1158 Duke Henry the Lion had made it an important commercial center, the presence there of Jewish merchants in the twelfth century may safely be assumed. The first authentic reference to a Jew of Munich is dated 1229, when Abraham de Munichen acted as a witness to the sale of a house in Ratisbon. According to other documents, Ludwig I. 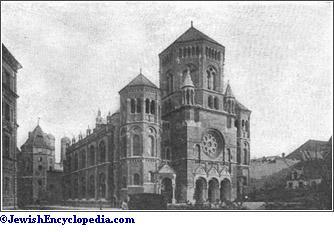 (1174-1231) permitted the Jews to build a synagogue (1210) and acquire a cemetery (1225). The Jews' street soon developed into a ghetto, beyond which the Jews were not permitted to live until 1440; the ghetto contained, besides the synagogue, a communal house, a ritual bath, a slaughter-house, and a hospital. By the second half of the thirteenth century the community had increased to200. If the documents are authentic, the Jews of Munich loaned money to Duke Otto I. (1120-83) to build Landshuth, and received in return special privileges, which were confirmed by Ludwig I., who in 1230 granted them the right to elect the so-called "Jews' judge." The accusation of ritual murder caused suffering to the Jews of Munich as to their coreligionists elsewhere. The persecution of 1248 was not very serious, but they suffered more in 1285, when, being charged with the purchase and murder of a Christian child, they were attacked by a mob (Oct. 12). The Jews fled to the synagogue, which was set on fire, and 180 perished in the flames. The names of 68 of these martyrs were inscribed in the death-list of the Memor-Book of Nuremberg, written in 1296. An investigation ordered by King Rudolph revealed the innocence of the accused; the prisoners were released by royal command, and their accusers were punished. 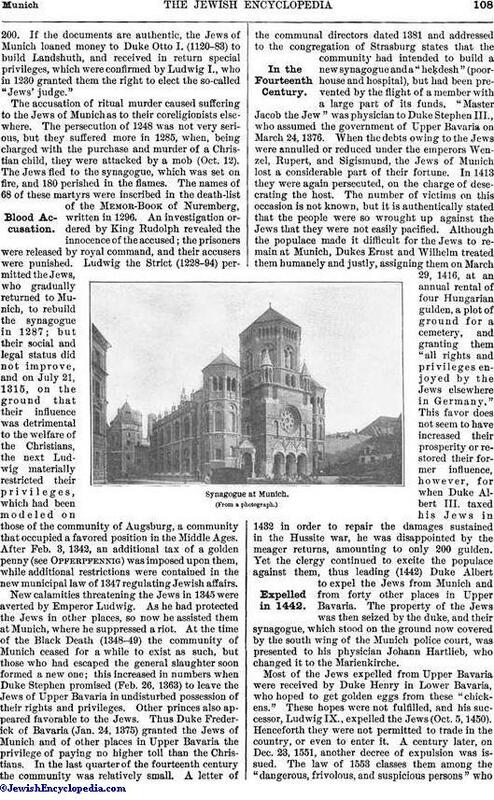 Ludwig the Strict (1228-94) permitted the Jews, who gradually returned to Munich, to rebuild the synagogue in 1287; but their social and legal status did not improve, and on July 21, 1315, on the ground that their influence was detrimental to the welfare of the Christians, the next Ludwig materially restricted their privileges, which had been modeled on those of the community of Augsburg, a community that occupied a favored position in the Middle Ages. After Feb. 3, 1342, an additional tax of a golden penny (see Opferpfennig) was imposed upon them, while additional restrictions were contained in the new municipal law of 1347 regulating Jewish affairs. New calamities threatening the Jews in 1345 were averted by Emperor Ludwig. As he had protected the Jews in other places, so now he assisted them at Munich, where he suppressed a riot. At the time of the Black Death (1348-49) the community of Munich ceased for a while to exist as such, but those who had escaped the general slaughter soon formed a new one; this increased in numbers when Duke Stephen promised (Feb. 26, 1363) to leave the Jews of Upper Bavaria in undisturbed possession of their rights and privileges. Other princes also appeared favorable to the Jews. Thus Duke Frederick of Bavaria (Jan. 24, 1375) granted the Jews of Munich and of other places in Upper Bavaria the privilege of paying no higher toll than the Christians. In the last quarter of the fourteenth century the community was relatively small. A letter of the communal directors dated 1381 and addressed to the congregation of Strasburg states that the community had intended to build a new synagogue and a "heḳdesh" (poor-house and hospital), but had been prevented by the flight of a member with a large part of its funds. "Master Jacob the Jew" was physician to Duke Stephen III., who assumed the government of Upper Bavaria on March 24, 1376. When the debts owing to the Jews were annulled or reduced under the emperors Wenzel, Rupert, and Sigismund, the Jews of Munich lost a considerable part of their fortune. In 1413 they were again persecuted, on the charge of desecrating the host. The number of victims on this occasion is not known, but it is authentically stated that the people were so wrought up against the Jews that they were not easily pacified. Although the populace made it difficult for the Jews to remain at Munich, Dukes Ernst and Wilhelm treated them humanely and justly, assigning them on March 29, 1416, at an annual rental of four Hungarian gulden, a plot of ground for a cemetery, and granting them "all rights and privileges enjoyed by the Jews elsewhere in Germany." This favor does not seem to have increased their prosperity or restored their former influence, however, for when Duke Albert III. taxed his Jews in 1432 in order to repair the damages sustained in the Hussite war, he was disappointed by the meager returns, amounting to only 200 gulden. Yet the clergy continued to excite the populace against them, thus leading (1442) Duke Albert to expel the Jews from Munich and from forty other places in Upper Bavaria. The property of the Jews was then seized by the duke, and their synagogue, which stood on the ground now covered by the south wing of the Munich police court, was presented to his physician Johann Hartlieb, who changed it to the Marienkirche. Most of the Jews expelled from Upper Bavaria were received by Duke Henry in Lower Bavaria, who hoped to get golden eggs from these "chickens." These hopes were not fulfilled, and his successor, Ludwig IX., expelled the Jews (Oct. 5, 1450). Henceforth they were not permitted to trade in the country, or even to enter it. A century later, on Dec. 23, 1551, another decree of expulsion was issued. The law of 1553 classes them among the "dangerous, frivolous, and suspicious persons" whomust be prevented from dwelling in the country or carrying on trade and industry in it. Jews obliged to pass through Bavaria had to procure a passport, for which they paid toll and convoy-money and the humiliating Leibzoll. An imperial privilege granted to the duke in 1566 declared contracts between Jews and Bavarian subjects void, thereby putting an end to all trade relations with the Christians. On March 12, 1715, the elector Max Emanuel ordered the deportation of the few Jews who, in spite of oppression and restriction, still remained in the country. In 1733 all current passports were recalled, and a new "Leibzoll" and convoy-tax introduced. These conditions continued under the elector Maximilian III. (1745-77), although the contracts made with Jews in foreign countries were declared to be valid in Bavaria. The Jews were furthermore excluded from all trades, military service, and merchant gilds, were denied entrance to the public baths, and were still forbidden to settle in Bavaria. A change for the better, due, perhaps, to Austrian influence, came in the last quarter of the eighteenth century, during the period of intellectual progress. On the introduction of new rules of exchange in 1785, made necessary by unfavorable financial conditions, the ministry at Munich took into consideration the status of the Bavarian Jews, and the bills drafted by the provisional government and the chief judge of Munich between 1785 and 1791 produced a considerable improvement in their position. The financial difficulties of the government rendered it necessary to be more lenient toward them. Those who possessed sufficient property to engage in industry were permitted to settle; the "Leibzoll" was repealed; and only a tax on patents of commerce was imposed. 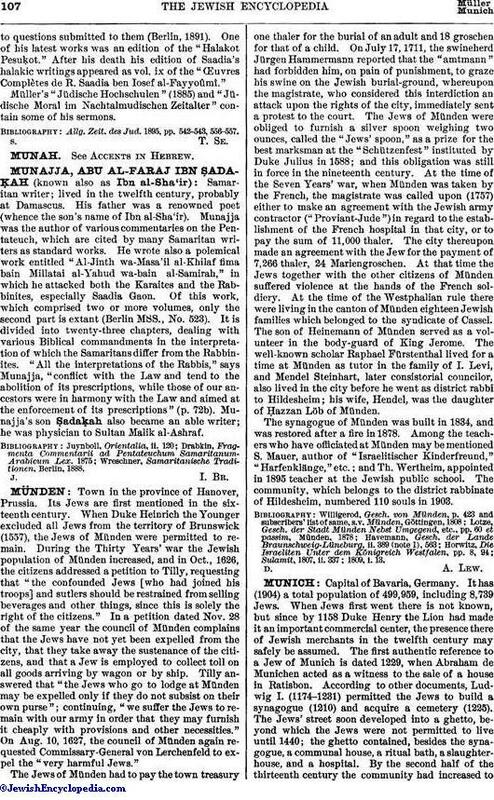 After Montgelas, the liberal president of the ministry, had succeeded in obtaining for them monopolies in certain commodities, and after some Jews had been ennobled while others received official recognition from the state, the community of Munich increased more rapidly, although in 1800 it numbered only thirty-one families, and had neither synagogue nor cemetery of its own. Its growth received a further impulse from the promises of civic liberty in 1813. The government permitted it to acquire a cemetery in 1818, and to build a synagogue in 1824. This synagogue was dedicated on April 11, 1827, and was replaced sixty years later by another and a finer edifice. The following rabbis have officiated since the community was reorganized: Ezekiel Hessel (1805-1824); Hirsch Aub (1825-71; d. June 2, 1875); Dr. Joseph Perles (1871-94); Dr. Cosmann Werner (since 1895); Dr. I. Finkelscherer (associate rabbi and teacher of religion). The ultra-Orthodox members of the community, who, because the principal synagogue contains an organ, do not attend it, formed the Congregation Ohel Jacob and built a separate synagogue, which was dedicated in 1892. As Bavarian law does not permit a secession from the official community, however, this newly established congregation, which numbered eighty members in 1904, still belongs to the older body. By a tacit agreement of the two parties three or four of the eighteen members of the board of directors of the community are taken from the Orthodox party and constitute the committee on ritual. The rabbi of the new congregation, Dr. Heinrich Ehrentreu (1904), is an official of the older congregation and acts as chief rabbi at certain ritual functions. The Congregation Ohel Jacob, which bears the official title of "Verein zur Förderung der Jüdischen Wissenschaft," supports a bet ha-midrash in addition to its synagogue, and receives from the community an annual subvention of 2,000 marks. Besides some fifty foundations for the benefit of orphans, the poor, lying-in patients, artisans, students, scholars, etc., there are the following philanthropic societies: a society for the prevention of mendicancy; a loan-society; a society for the promotion of learning and labor; a ladies' club; a society for dowries; a fresh-air society; a ḥebra ḳaddisha; a union of Jewish benevolent societies; an intelligence bureau; branches of the Alliance Israélite Universelle, of the Esra society for the aid of German Jews, and a Jewish ladies' home; an orphan asylum; a poor-fund, managed by the community; a society for Jewish history and literature; and the Munich lodge of the I. O. B. B. 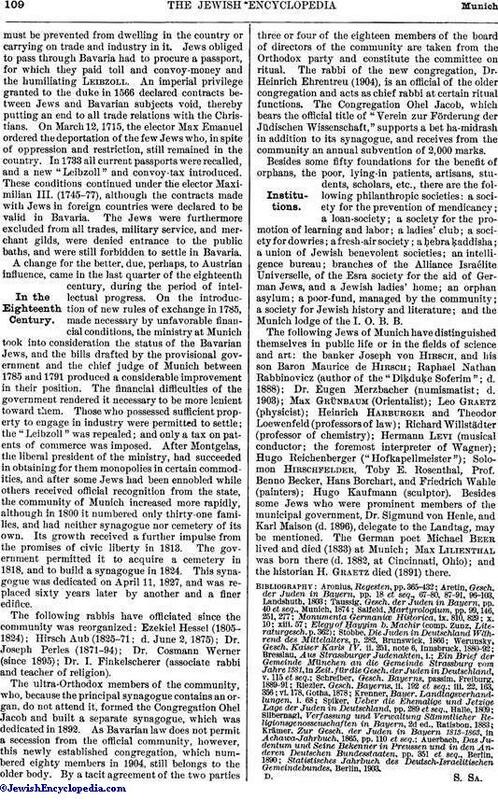 The following Jews of Munich have distinguished themselves in public life or in the fields of science and art: the banker Joseph von Hirsch, and his son Baron Maurice de Hirsch; Raphael Nathan Rabbinovicz (author of the "Diḳduḳe Soferim"; d. 1888); Dr. Eugen Merzbacher (numismatist; d. 1903); Max Grünbaum (Orientalist); Leo Graetz (physicist); Heinrich Harburger and Theodor Loewenfeld (professors of law); Richard Willstädter (professor of chemistry); Hermann Levi (musical conductor; the foremost interpreter of Wagner); Hugo Reichenberger ("Hofkapellmeister"); Solomon Hirschfelder, Toby E. Rosenthal, Prof. Benno Becker, Hans Borchart, and Friedrich Wahle (painters); Hugo Kaufmann (sculptor). Besides some Jews who were prominent members of the municipal government, Dr. Sigmund von Henle, and Karl Maison (d. 1896), delegate to the Landtag, may be mentioned. The German poet Michael Beer lived and died (1833) at Munich; Max Lilienthal was born there (d. 1882, at Cincinnati, Ohio); and the historian H. Graetz died (1891) there.